The Nikon D800 is the highest resolution digital SLR in the 35mm camera format but is the 36 million-pixel D800 a step too far? Casual observers have long made their choice of digital camera largely based on how many pixels it claims to offer, most understanding the principle that more is better. However, caveats apply. Crowding too many pixels on a physically small sensor can have a detrimental effect on image quality. It introduces visible grain and a gritty appearance if shooting in low light and/or at higher ISO speeds. Added to this, lens type and quality also affect the image, governing how much light is let in and directed onto the sensor. But of course while on a digital SLR the lens can be swapped to best befit the circumstances, the sensor remains fixed in place. Pitched at semi professionals and pros, the Nikon D800's chip has at least been reasonably future-proofed. That's because it offers a maximum resolution of 36 megapixels. That's the highest pixel count available on a 35mm format DSLR, and twice as many as most professional models ofer. The sensor is physically large too; it's 'full frame', meaning that it's a match for a frame of 35mm film, so there's no odd multiplication needing to be done with an attached lens to come up with the '35mm equivalent' focal range. Simply put if you attach a 16-35mm lens to the D800 – as we have for our test – that's exactly what the focal range is. The Nikon D800 then is a camera for those requiring a high level of detail above all else, perhaps because of a need to deliver pictures that can be printed billboard size. This kind of pixel count was previously only achievable if shooting on a medium format camera with an expensive (£15-£20K) digital back. Given that, while the uninitiated may baulk at the D800's £2,399.99 body only price, this Nikon may actually be something of a bargain, although it's obvisouly not as affordable as entry-level models such as the Nikon D3200 and the Canon EOS 650D. Does it live up to the billing? Flick the reassuringly chunky on/off switch that ergonomically encircles the shutter release button and, as we'd expect, the D800 readies itself for action nigh instantly. All the attendant manual controls we might expect to find on a pro DSLR are also here; thick-set shooting mode dials, operation quickening command dials, plus plenty of dedicated backplate buttons providing functional shortcuts in both capture and review modes. There's even a small 'LV' (Live View) button at the back, a press of which prompts the camera's mirror mechanism to flip out of the way and present a live feed to the LCD screen; crucial for shooting video. 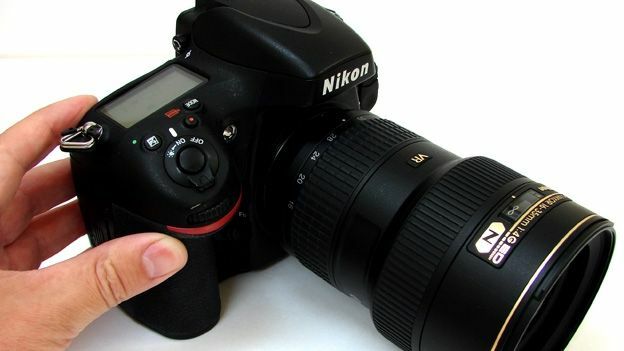 A tiny red record button is presented alongside the shutter release to commence filming, though we did wonder why Nikon had made this control so small when video is such a big feature on today's DSLRs. As befits a DSLR pitched at people who take pictures for money on a daily basis, the D800 features a built-to-last workhorse-like build. Its manufacturer claims its shutter release system has been tested to at least a 200,000 shot lifespan, the camera body features the same weather sealing found on the earlier Nikon D7000 DSLR. Take a shot with the D800 and, since the camera's auto focus mechanism with our attached lens was almost inaudible, the 'clunk' of the shutter release performs the task of providing assurance that a shot's been taken without drawing undue attention. Though the camera body remains relatively lightweight and portable – compared to a range topping but less pixel-rich pro DSLR like Nikon's D4 with battery grip at least – whichever lens is attached obviously adds bulk and heft to the D800. It's also not a camera for surreptitious photography, unless you're going to attach a super telephoto lens. Using the chunky D800 will mark you out as a 'professional' in public, whether you feel deserving of the term or not. And while it's not weatherproof like the Pentax K-30, the D800 is certainly durable. The fixed, non-angle adjustable backplate LCD here is larger than most at 3.2-inches rather than the standard three, and comes with a respectable screen resolution for its class, of 920,000 dots. Also nifty is an on-screen level gauge, or 'virtual horizon' as the D800's menu refers to it, enabling photographers to get their horizons straight when shooting handheld and without the aid of a tripod. However we did still find ourselves having to squint at the screen in bright sunlight. Signalling again that this camera is a professional tool, there's a second smaller screen on the top plate. This rectangular display shows key information such as the shooting mode in use, image quality, focus mode, white balance and number of shots remaining. It acts as a quick-glance reference and time saver, preventing the need to tab through a larger selection of options on the main back screen when all you want to adjust are the essentials. The Nikon D800 is supplied with a new rechargeable MB-D12 lithium ion battery pack, good for a very respectable 900 shots from a full charge – twice as many as one might expect from a consumer level camera. But then as a prospective owner you are paying up to four times the price of the average body-only DSLR. As noted in our intro, the D800 offers a full frame sensor – in other words one of comparable size to an actual frame of 35mm film – which Nikon calls its FX format. This is physically larger than the APS-C sensors used in non-specialist DSLRs, in other words the vast majority of consumer models, which Nikon refers to as DX format. Thus if you use a DX format lens on an FX format camera, a cropping of the image takes place, and on the D800 in particular the resolution falls to a still plentiful 15.4 megapixels. It does however mean anyone with a Nikon lens they've bought for a non-pro DSLR, which they may conceivably be stepping up from can still use it with this one. Nikon supplied our sample with a wide angle 16-35mm f/1.4 lens; great for cramming expansive landscapes into the frame, or achieving a shallow depth of field (subject sharp, background blurred) if photographing or filming closer subjects, not so great for grabbing candid close ups from afar. However a bright aperture lens that lets in plenty of light is better for shooting in a variety of conditions and so more flexible, and so it proved on test, shadow areas remaining noise free. Colours also look great straight from the camera, all those pixels delivering a life-like image with plenty of punch, even if the file sizes – 18MB for an unadulterated JPEG – might have your hard drive groaning. The D800 also naturally offers 1920x1080 pixels Full HD video, with a respectably smooth capture rate of 30fps. Since this only equates to two megapixels though, arguably shooting video with the D800 isn't making the most of its capabilities, and a lower resolution, cheaper DSLR might actually be a more sensible bet – and not necessarily a Nikon one either. Re-igniting the 'how many pixels do we actually need?' debate, the Nikon D800 comes across as much as a manufacturer's statement of capability as a peerless product in its own right. Yes it is a lot of money; but if you don't need the pixels you don't need to spend the pounds. It's also worth mentioning that the D800 is also available in the shape of its almost identical twin the D800E; even pricier at a body-only £2689.99. Though the resolution isn't any higher, this iteration is an even more specialised tool aimed at commercial photographers who want to eek out just that little more detail and definition, as in-camera filtering (which helps produce a clean image straight out of the camera on the E-less D800), isn't applied. For now though, the D800 offers all the future proofing a photo enthusiast could conceivably need, if they can justify stumping up the cash and telling themselves that yes, they do really, truly need all those pixels.